I love pasta… well, I love carbs in general, but pasta and noodles are something I think I could eat every single day if my hips and thighs wouldn’t hate me for it. In the past I’ve talked about my distain for the low-carb pasta sub…the ‘zoodle’. Booooo. Yea, I’m still a total brat about it. I’ve compromised in the past by doing a 50/50 combo of real pasta and ‘zoodles’ and that’s probably as far as I can go. Sorry, but ‘zoodles’ are not noodle or pasta and you’ll never trick me into thinking they’re the same. Nope, nope, nope. 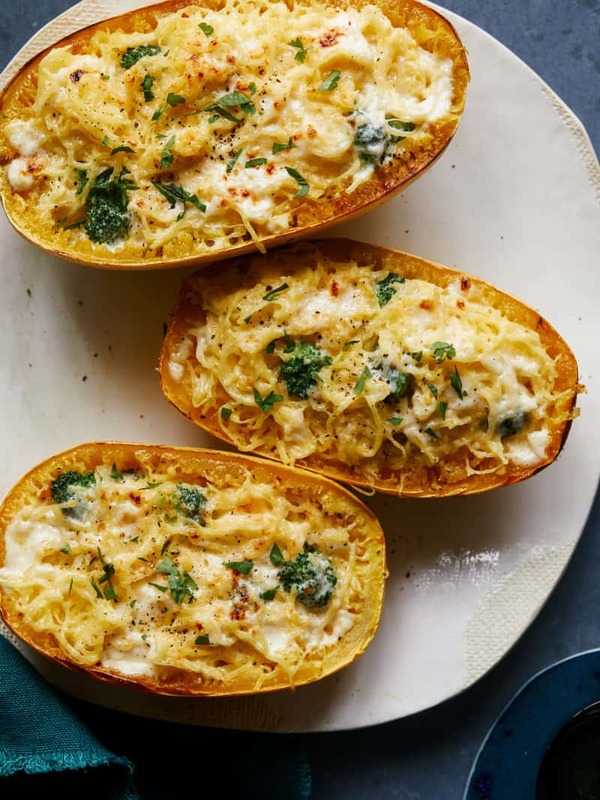 There’s ONE thing that I’m okay with and I think it’s because I don’t really look at it like it’s a pasta substitute, but it’s own thing all together, and that’s the spaghetti squash! Honestly, I have no idea why I consider this to be more different than anything other veg to noodle substitute, but I just do. Which brings me to today’s yummy dish, our Spaghetti Squash and Broccoli Alfredo! I love making this dish when I want to treat myself, but not go balls to the wall cream and carb fest, you know? This dish is the perfect compromise. I still get to indulge in the rich and creamy, garlic infused sauce, but I don’t feel quite as sluggish after this meal because of the squash replacing the pasta. 2. Slicesquash in half lengthwise and place onto a baking sheet, cut side down and roast for about 1 hour or until squash becomes fork tender. 3. Allow squash to cool for about 15 minutes, before scraping the flesh out with a fork, making sure to keep the peels intact. Place squash innards in a mixing bowl, lightly season with salt and pepper and set aside. 4. Place a skillet over medium heat and add oil and butter. Saute garlic and shallots for 2 to 3 minutes. 5. Add cream and broccoli and simmer until liquid has reduced by half and broccoli is slightly tender. Season with salt and pepper. Begin stirring in small amount of Parmesan into the cream until the sauce thickens enough to coat the back of a wooden spoon. 6. 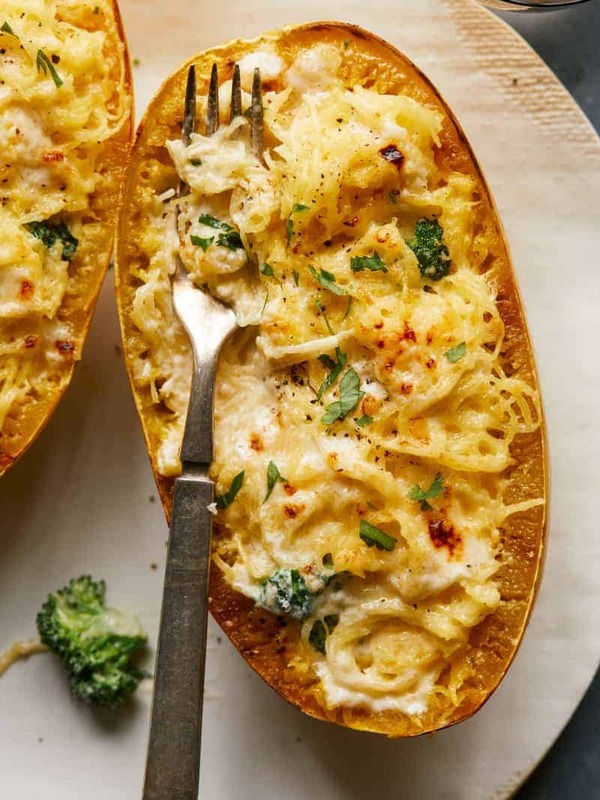 Add spaghetti squash to the skillet and and toss together with alfredo sauce and broccoli. Adjust seasonings and stuff hollowed squash peels with squash mixture. 7. Top each stuffed squash with a sprinkle of Gruyere and cracked black pepper. Place squash until a broiler and broil for about 2 minutes or until the tops of each squash brown and bubble. 8. Top each stuffed squash with fresh basil leaves and serve. I just made this tonight and it was amazing. Thanks so much for the recipe! Love this recipe! We add hot Italian sausage to make it a complete meal. Make it several times a month. Can anyone provide nutritional information. Especially calories and carb count.